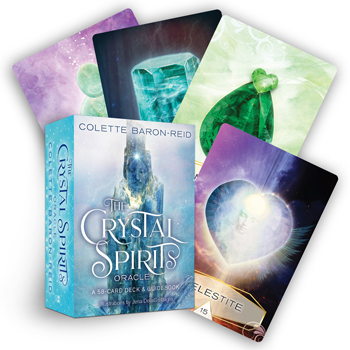 Internationally acclaimed spiritual teacher and best-selling author Colette Baron-Reid offers a vibrantly illustrated oracle deck of 58 crystals, each selected for their healing powers and ability to help you channel divine guidance from the Universe. Legends about the healing powers of crystals have endured for millennia, with stories passed among ancient healers, medicine men and women, and shamans. Every crystal is a gift from Mother Earth, offering a return to balance and well-being through their stabilizing energy. In The Crystal Spirits Oracle, internationally renowned spiritual teacher Colette Baron-Reid explores the unique personalities and properties of 58 crystals, with stunning art by Jena DellaGrottaglia. With the messages of the crystals, you'll learn how to connect with divine guidance and align with the consciousness of the universe so you can take charge of your destiny.